One of the most important aspects of your blog design is your sidebar—after all, it’s on almost all of your pages! …But I’ve recently discovered that using an image in your sidebar is a HUGE mistake. And now I’m going to tell you why. On Social Triggers, I have two separate cornerstone content pieces. One is about building an email list, and the other is about generating more sales. Overall, it looks pretty good. But when I looked at my conversion goals, almost none of my traffic hit those pages. It made no sense to me, so I decided to run some heat map tests using Clicktale. And that’s when I discovered the major problem with these images. There’s a few different heat maps available. 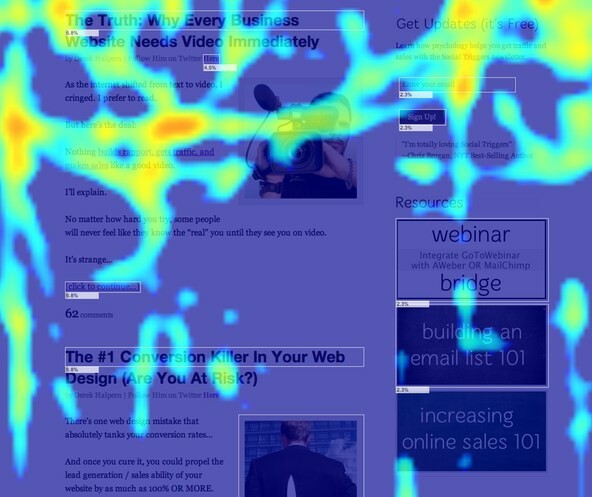 There’s attention-based heat mapping, mouse movements, mouse clicks, and scroll reach. I won’t go into detail about these four types of heat maps today, but for this test, I decided to focus on mouse movements. After all, if you want someone to click on something, their mouse needs to hover over the section that needs to be clicked, right? As you can see, the mouse pretty much went everywhere… but over those images. As a matter of fact, the mouse went NEXT to the images, and then scrolled downwards, which means that people saw the images and decided to ignore them. Why Did People Ignore Images In My Sidebar? Heat maps are rarely conclusive because there’s a lot of things that affect mouse movements. I reached out to a bunch of people and asked them about my resource pages. One of them was an advertisement, but the other two weren’t. But the truth became apparent. 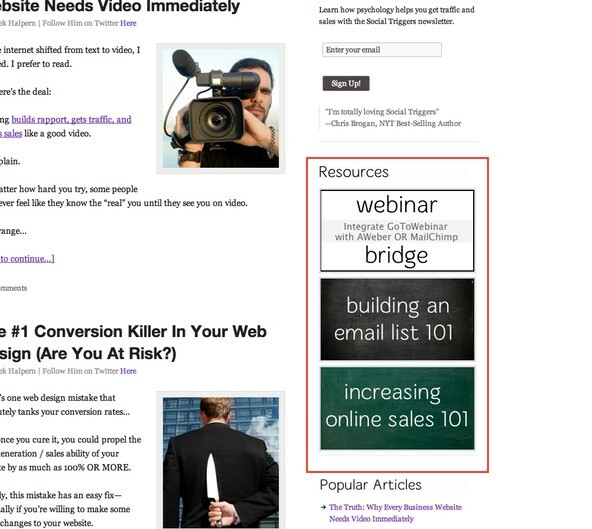 Images in sidebars are viewed as ads. And if you’re using an image to promote some of your great free content, you may be losing out on potential clicks and conversions. Luckily there’s a solution, and I plan on implementing it real soon. When you want to use an image to promote some of your content, you must ensure that people don’t view it as an advertisement. To do that, I encourage you to mention that you’re promoting content in your image. However, you can also simply include a picture of yourself in the graphic, and I’m betting that will gather a ton of clicks. (Pictures of people draw attention, and when you’re using your picture, it should gather even more attention). Personally, I plan on working some images of myself into my sidebar images and testing the results. Now I’ll pass it to you. What are you experience with images in the sidebar? Do you view them as ads? How do you help people understand that they’re not ads?